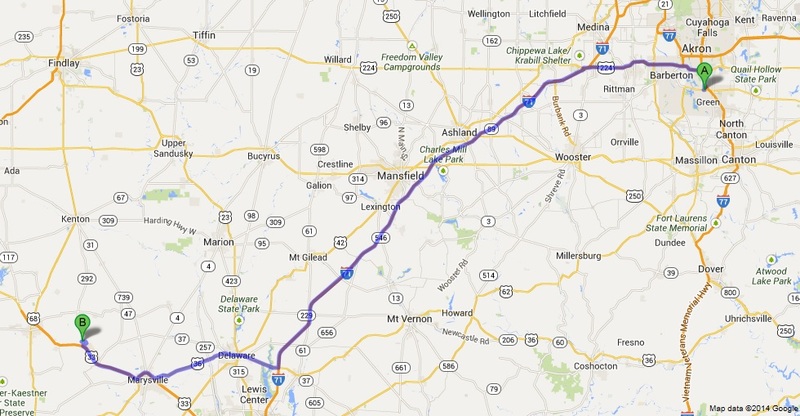 A page on the Internet web site 'Green Historical Society - The History of Green, Ohio' at http://www.greenhistoricalsociety.com/ includes an old photograph which absolutely positively was NOT taken in the Green area and was indeed taken over 100 miles away. Who can tell us which photo does not belong on that web site? Extra Credit: Who can tell us where that photo was actually taken? This episode should provide everyone with an opportunity to explore that web site and learn even more about 'The (correct) History of Green'. It should also prepare you for future Episodes of 'THE GREEN HISTORY DETECTIVES'. The photo includes the word: "GREEN"
Bonus Clue: The photo includes the word: "LANE"
and apparently does not give you access to the photo from that page. That is, "You can't get there from here." and you MUST click on one of the phrases in that list above to go to the page that the photo is on. I suppose that could be considered to be another error. Note too that there are other phrases given in the list above, below 'Our Archive', that do not associate directly to sections provided on the 'Our Archive' page, thus causing the user to become annoyed, confused, and frustrated when traversing through that web site. Such issues prevent a web site from being 'user-friendly'. and you can only access that page by clicking on 'Our Archive' followed by 'Postcards from Green - UPDATED'. The solution is provided in the email message below that was sent to the folks at the Green Historical Society. Note that the Zoom and Pan feature was not available in the email message but are provided for visitors of this web page. 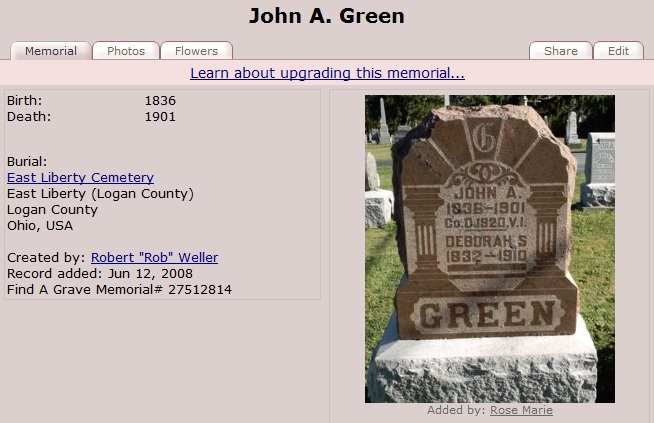 Your Internet web site entitled ‘Green Historical Society – The History of Green, Ohio’ is greatly appreciated. Surely, visitors to your web site assume that the ‘West Section of East Liberty Cemetery’, as written on that old photo, is referring to the East Liberty Cemetery in Green, Ohio. 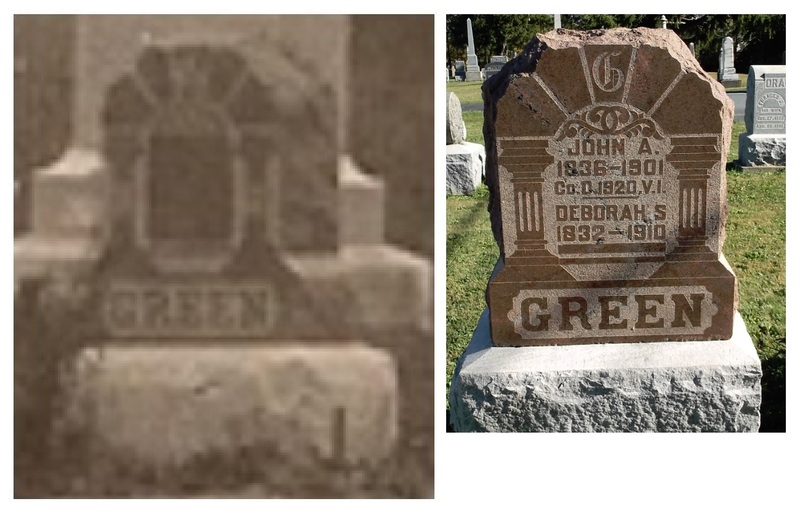 The only 'GREEN' at the East Liberty Cemetery in Green, Ohio is for Bessie Green Abbott, but no photo is available of that stone. 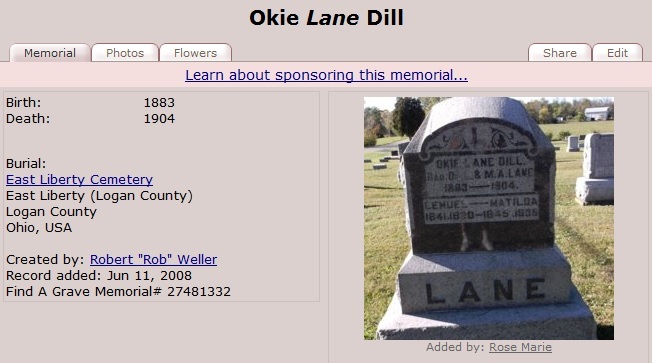 Evidently, there is no 'LANE' at that cemetery. 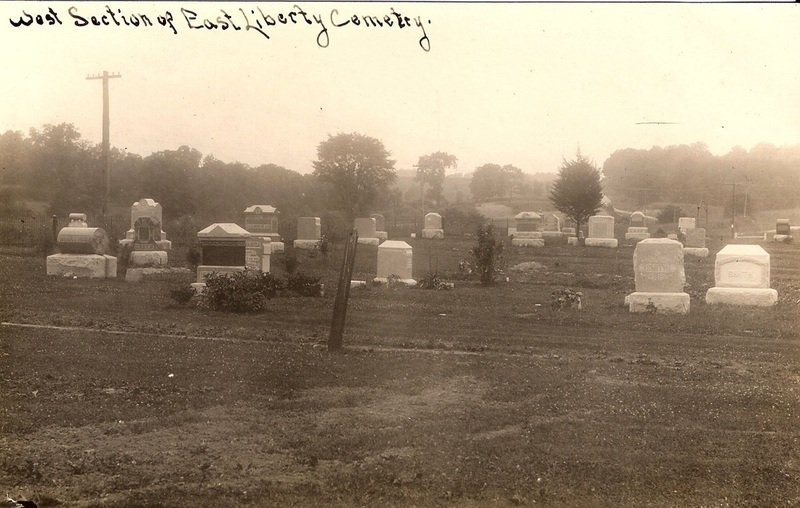 The information provided above shows that this old photo, that resides on the ‘Postcards from Green’ page of the ‘Green Historical Society – The History of Green, Ohio’ web site, was not taken at the East Liberty Cemetery in Green, Ohio, but was indeed taken at the East Liberty Cemetery in East Liberty, Ohio. 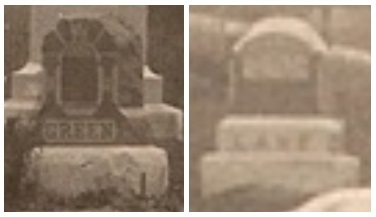 Evidently, this old photo was taken in or before 1920. 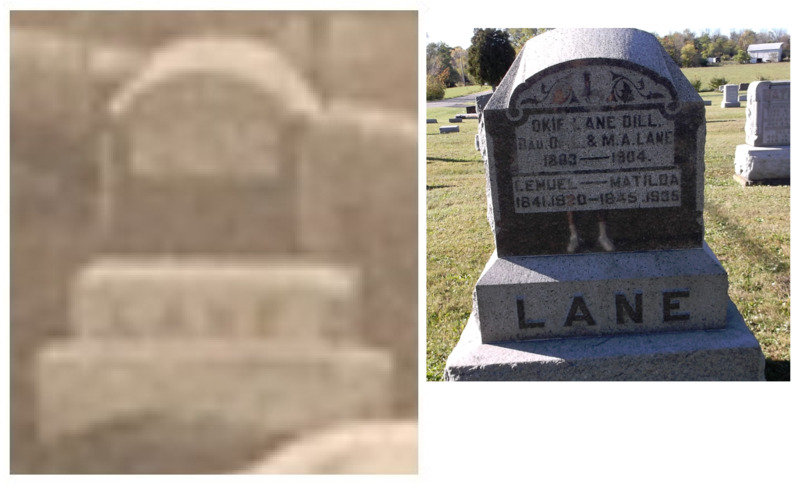 Evidence of that is the recent photo of the ‘LANE’ stone (above right), which shows additional information on the lower portion of the stone that must have been added during or after 1920. 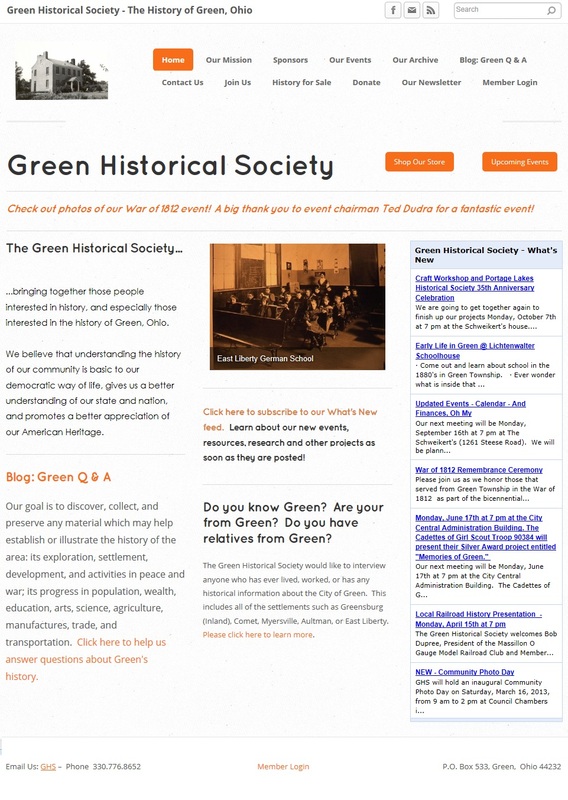 You may be interested in other issues discovered with the Green Historical Society web site that might confuse visitors. For example, ‘Postcards from Green - UPDATED’ is shown in the ‘Our Archives’ list when a user hovers the mouse pointer over ‘Our Archives’. 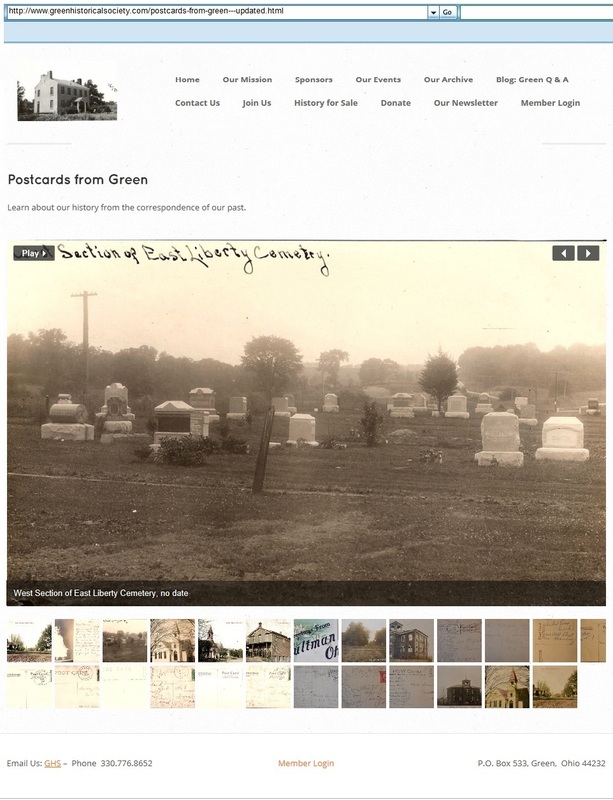 However, the ‘Postcards from Green’ page cannot be accessed from the ‘Our Archives’ page. 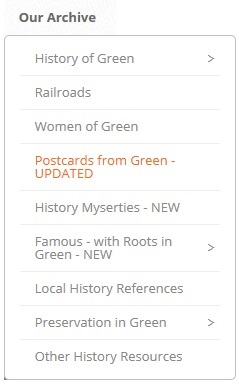 The ‘Postcards from Green’ page can only be accessed by clicking on ‘Postcards from Green - UPDATED’ in the list. There are other phrases (named sections) given in the ‘Our Archives’ list that are also not provided on the 'Our Archive' page. This email message is also attached in the Microsoft Word file ThisOldPhoto.doc.